An Austrian ambassador who lived in Moscow in the 16th century rendered us assistance in the compilation of a classic guide to the Russian capital. This special edition is for time travelers. 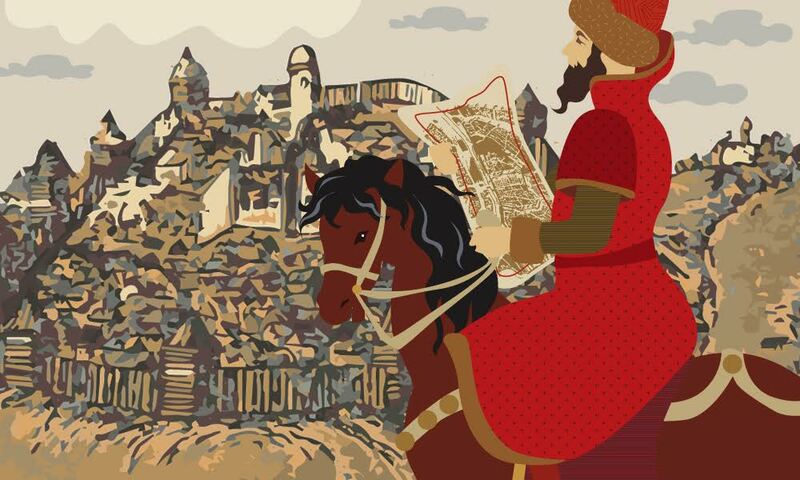 Medieval Russia and Moscow were not popular destinations among foreign tourists: Few dared to embark on a journey to a land that at the time remained shrouded in mystery. However, the Austrian ambassador Sigismund von Herberstein remedied the situation by writing his Notes on Muscovite Affairs, an early 16th-century collection of tips for foreign travelers in the principality of Muscovy. The book opens with a warning to the reader that Rus' (what medieval Russia was known as) was significantly different from other states of the time in terms of morals, religious beliefs and military discipline. If you dear reader are not afraid of the unknown, then Muscovy is waiting for you! In the early 16th century, Moscow boasted numerous exquisite, though somewhat massive buildings constructed in the traditions of Russian wooden architecture. "The city itself is wooden and fairly vast; it seems even more so from afar, as spacious gardens and vegetable gardens surrounding each house make the city even bigger. At a distance, separated from the city by fields and meadows, there are more houses, suburban settlements and a few monasteries, which form the appearance of a separate city." "The cold is sometimes so fierce that the horrid frost makes the earth crack, as it occurs in our land in summer in times of extraordinary heat. In such weather, even water spilled outdoors or spit from your mouth turns into ice before reaching the ground. Such cold is counterpoised by extreme heat, for instance, as it was in 1525 when the abundant heat of the sun destroyed almost all crops." In order to blend in and not stand out from the crowd, he recommended changing foreign clothes to something more familiar to the Russian eye. The locals, he wrote, wore long narrow-sleeved caftans (frocks) without pleats. Boots were typically red and soles were attached with tiny iron nails. Shirt collars were decorated with colored embroidery and buttoned with silver or gilded copper balls and sometimes with pearls. When you arrive in 16th-century Muscovy, he said, do not forget to pay your respects to the grand duke. This was the title of Muscovy's ruler before tsardom was introduced. Make sure you are familiar with ancient Russian etiquette so as not to embarrass yourself. If you want to show your gratitude to someone who has rendered you a service, you bow and touch the ground with your hand. If you want to thank the grand duke for a big favor, or to ask for one, bow down low enough for your forehead to touch the floor (yes, your yoga experience might come in handy here). Don’t be surprised, he wrote, when you see a washbasin with two people to wash your hands and towels beside the grand duke. As Herberstein explains, the duke considers ambassadors of the Roman Catholic faith to be impure, so he washes his hands after each handshake. Muscovites revered few things as ardently as their faith. It is the religious rites, he writes, that foreigners should pay particular attention to. When Russians cross themselves, they do it with their right hand, gently touching first their forehead, then chest, then right and left shoulders, forming a cross. Should you cross yourself in a different manner, others will immediately know that you are a representative of a different confession. He suggested dropping by the fair to buy some local souvenirs, such as Russian silver ingots, silk and gold-embroidered cloths, pearls and precious stones. You could also find the long white teeth of animals called walruses, who inhabit the Northern Sea. Turks, for example, were fond of using them to make dagger handles. But he said that you needed to stay alert when shopping: At a Russian bazaar, foreigners were charged much higher prices than locals, so you could be asked to pay five, 10, or even 20 gold 10-ruble coins for what could be purchased with just one coin by a Russian. Russia's principal export item at the time was fur of all kinds and colors. That is why it would be unthinkable to leave Muscovy without a warm fur coat. There was a choice of fox fur, luxurious sable of squirrel skins. Polar fox was a practical choice for long journeys, as it helps you keep warm better than other furs. Domestic cat skins were considered to be appropriate only for women. If you have a meeting with Russians, whatever the reason, you won't get away without an invitation to taste their bread and salt, he wrote. Bread was a way of showing your grace to the guest, and salt a symbol of love, so at the duke's feast the greatest honor for a guest was to be offered salt from the duke's table. Muscovite meals were solemn and unhurried. "They often spend the entire day in meetings and discussions of particularly important affairs,” he wrote. “Similarly, they sometimes spend the entire day feasting and banqueting, to disperse only when dusk sets in." Locals were known for their talent of making their guests drink, because a good reception and a delicious meal Muscovy-style simply was not possible without getting your guests drunk. Make sure to partake in Russia's principal entertainment, he wrote, which was hunting. There was no risk of infuriating animal rights organizations. A hunt was considered a grand outing undertaken by a large party of noblemen on horseback with an even larger group of servants. Hunters also used hounds and falcons. The one whose dog chased the most game was considered the hero of the day. Herberstein recalls a particularly flamboyant hare hunt that resulted in about 400 trophies. Another Russian amusement, reminiscent of Spanish bullfights, but much more dangerous, was the bear fight. Bears were kept in a large house that was especially built for this purpose. At the duke's order, his underlings would attack the bears with wooden hay forks and put up a fight. You should not leave Muscovy without gifts. Thus, the grand duke presented Herberstein with "a sled with a fine horse and a cover made of polar bear fur and other expensive materials." Sure beats a refrigerator magnet!